‘Look at the cherry blossoms! ‘Tis the season, the time when Japan is filled with trails of scented blossoms of pink, red, and white. 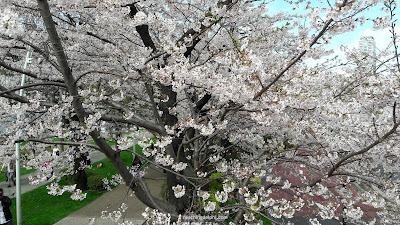 It’s even cherry blossom season in other parts of the world, so today I bring you this post on the delicate sakura—the Japanese cherry blossom. 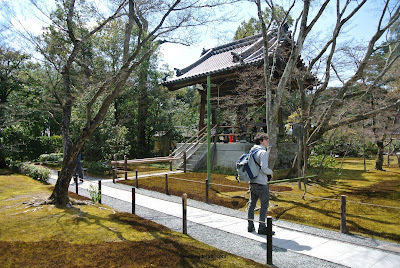 This is the first of the three-part series on the Japanese Cherry Blossom Trail. In this series, I will share facts relating to the sakura, my travel experiences to Japan during this season, and some useful information for your travels to this country. The cherry blossom is called sakura after the Japanese cherry (trees of the genus Prunus). Did you know that the sakura is the national flower of Japan? Today, sakura can be found all over the world, especially in temperate zones (such as in the US, Germany, Netherlands, Nepal, Taiwan, South Korea, Thailand, New Zealand, and Australia). It’s easier than ever to see the glory of these flowers! You have those facts memorised? Great! Next, we often hear that cherry blossom season lasts two to three weeks. Does this mean we need to be at the location for all days? That’s entirely up to you, but I would love to someday. Stage 1—The formation of green buds indicating the arrival of spring. Stage 2—Florets become visible. This usually happens 14 days prior the peak bloom. Here is when the countdown begins. Stage 3—The florets are extended. This is usually 12 days before the peak bloom. Stage 4—Flower stems can be noticed. This is often six days before the peak bloom. Stage 5—Fluffy white/pink/red flowers are formed. This is usually on days 10 and 11. Stage 6—The peak! At this point, almost 70% of the blossoms have bloomed. I was lucky to see almost all these stages over one rather short visit. How so? you may ask. Well, we need to take note that the different stages above are not mathematical formulas. Not all of the flowers are necessarily formed on day 0 across the country, and not all 100% florets become visible on next day, and so forth. So, if you plan your travel accordingly, you can get to see the blossoms in different places at different stages. There is a general bloom season (almost always perfect in Japan😉), but there are slight variations depending on where you are. Get the picture now? Just cross check your travel itinerary with the Japanese Sakura Calendar issued by Japanese officials. It captures the cherry blossom stages and dates by region and comes in handy when deciding your cherry blossom plans. 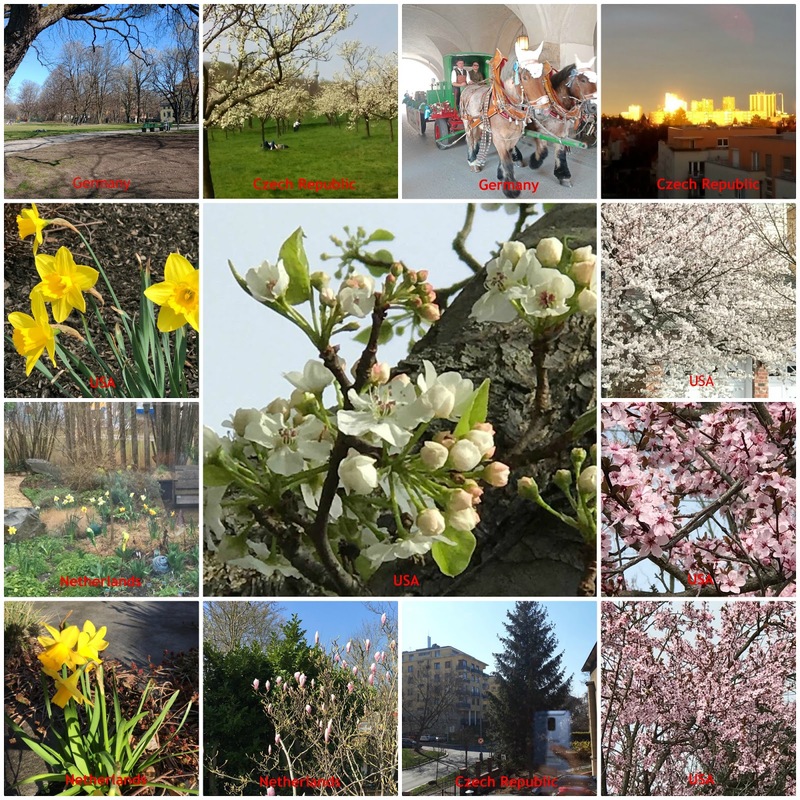 My cherry blossom trail in 2017 covered three districts over eight days. 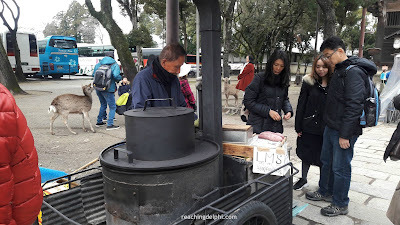 It started in Osaka (Kansai district, the south-central region in Honshu), travelled north to Nagoya (Chūbu region, the central region in Honshu), and ended our trip in Tokyo (Kantō region the south-eastern region of Honshu). In this post, we will only explore the blooms in the surrounding areas of the Kansai district. In terms of stages, I will show you pictures representing stages 0–2 of the blooms. As I mentioned earlier, this trip was my first visit to Japan and also the first time I got to see cherry flowers in the making. That year, the cold climate lingered a little longer than forecasted, so I was lucky. The cherry blossom season was in the making for the grand display when I arrived! For the south-central visit, Osaka was our home base. From here, we made day trips to Kyoto, Nara and Hiroshima. 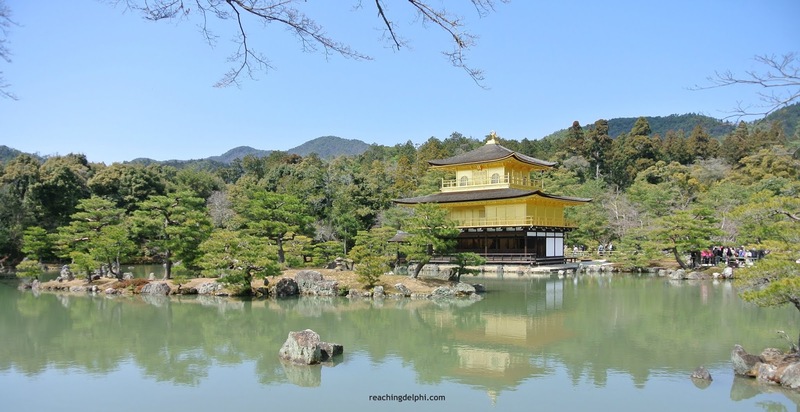 KinKaku-ji’s official name is Rokuon-ji. It translates to “Temple of the Golden Pavilion.” This is one of the most visited Buddhist temples in Kyoto district. Interestingly, the temple was built as a villa in 1397 and belonged to Saionji Kintsune, an influential statesman at that time. The building was later bought by Ashikaga Yoshimitsu, who transformed it into building complex. Upon his death, the complex was converted to a Zen temple. The golden structure we see here is the only one left of this complex and was rebuilt in 1955. The rest of the arrangements here were destroyed over the years during different wars. Kinkaku-ji is located in northern Kyoto. You can get here by train. The nearest train station to Kinkaku-ji is Kyoto Station. 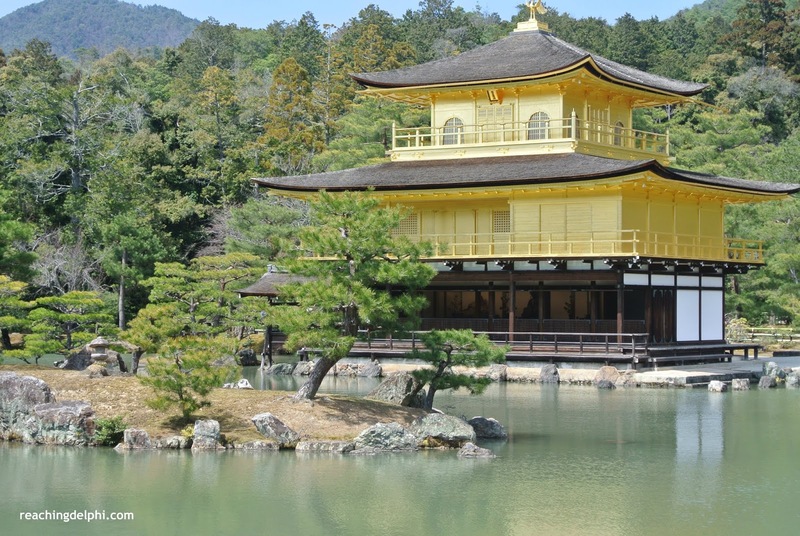 From Kyoto Station, take the local Kyoto intercity transfer, a bus, to the building complex. In ‘Between stops there's a Chiyo somewhere’, I talked about a beautiful geisha named Chiyo (from the novel, Memoirs of a Geisha) in Kyoto. Years on, she still lives in my head. Here are some photos of the surrounding area. Can you see the cherry buds and the florets? Yep, it’s stages 1 and 2. 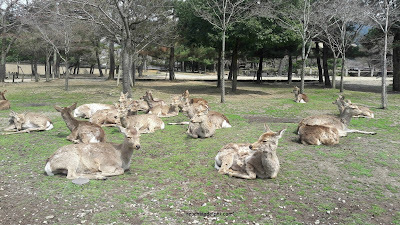 Nara Park is located in Nara. Nara’s history dates back to the 8th century, when it was Japan’s first permanent capital. Today, Nara Park is a UNESCO World Heritage Sites. 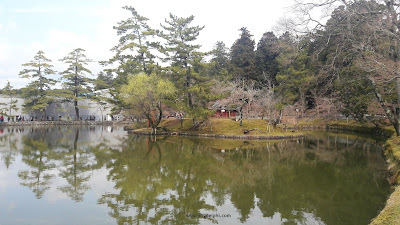 Nara Park is also one of the oldest parks in Japan. Who are you trying to get a picture of, me or the Geisha? To get to Nara, try a local train. 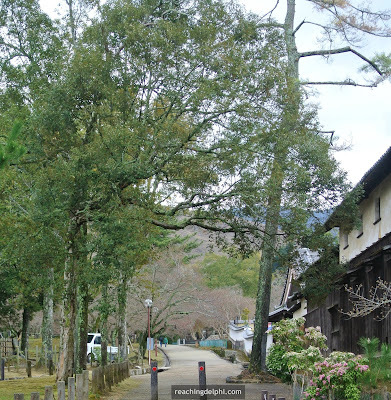 Nara is easily accessible from Osaka in just 45 minutes. 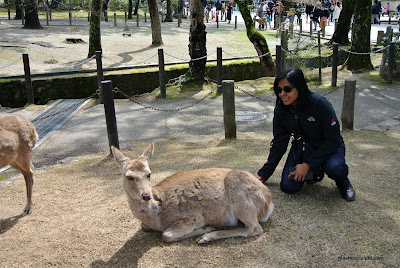 The main attraction in Nara is the deer park. You will go wild seeing them! 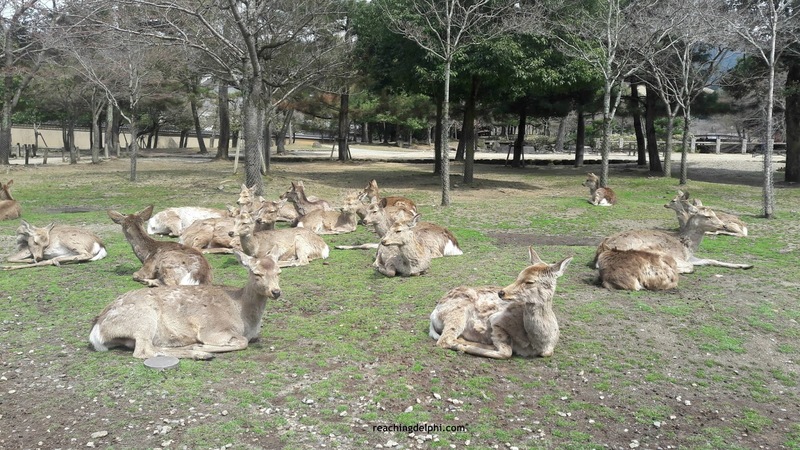 Nara is home to over one thousand free-roaming deer. 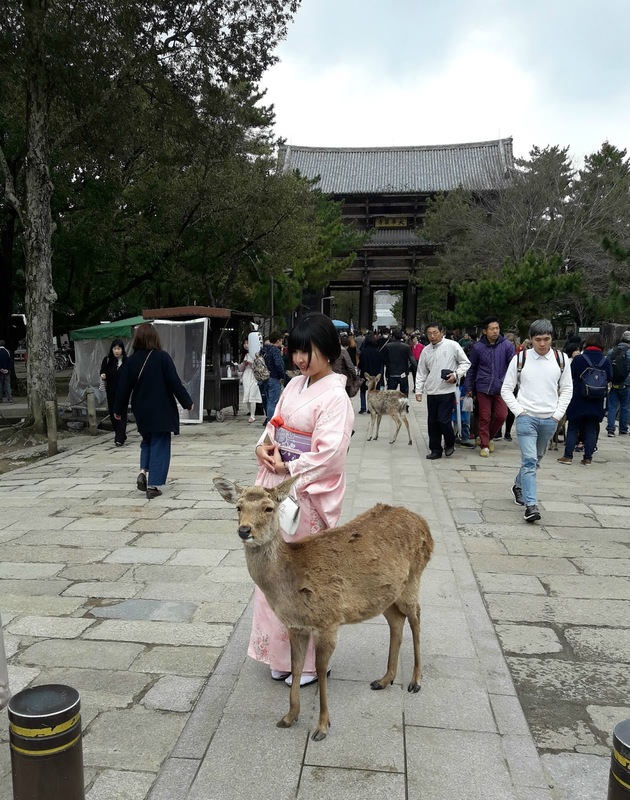 In the Shinto religion, the deer is considered a sacred animal. It is funny how things pop out because just as I was writing this post, CNN also posted an article on these deer. Check it out! Some of the deer can get aggressive, but it looks like they decided to behave on the day I was there. Look here—the deer below were still napping in the sun. How many of us do you have? Visitors to the park will also get a chance to see Kofokuji. This is the temple of the once most powerful clan in Nara. Within the park grounds, you will also see a thousand-year-old pagoda. Just look up to see it! I hope you spotted the lovely cherry buds and flowers among these photos. How do you get to Osaka and other areas in the Kansai region? Bicycles—Mama-charis are bicycles. They are available for rent or for purchase. What is the official language in Japan, and can I get by with only English? Japanese is the national language. Most tourist locations have trained English-speaking staff. If you are more adventurous or prefer independent travel, it would be helpful to know a few essential phrases to get by. Otherwise, there is always Google translation apps. On that note, don’t worry if you do not have Wi-Fi services for online translations. But maybe try something more personal and go for a human interpreter instead. 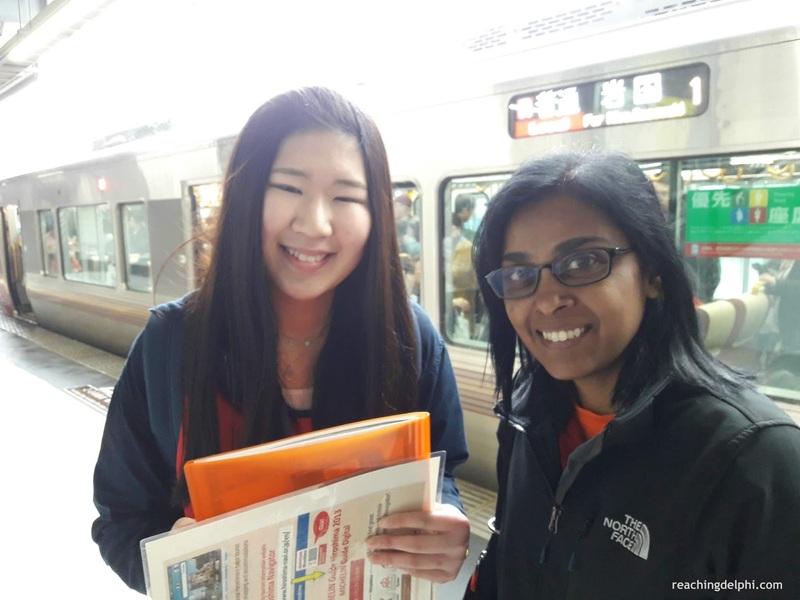 😊 You will notice many local students at the train stations offering you help to locate the right platforms and trains or even volunteering to show you around. It was such a pleasure to accept their company. This student in the picture below made sure we got on the right train to Nara. She was practising her English with me while I was learning more about her culture. How are Wi-Fi connections in Japan? Free Wi-Fi is available in most cities, but if you wish to have a consistent and reliable service, you could pick up a pocket Wi-Fi as I did. It is a service provided by a company called Japan Wireless. I pre-ordered the Wi-Fi router before I arrived and picked it up from the local post office where it was sent. I need coffee, can I get some in Japan? Welcome to the land of awesome, healthy green tea and delicious hot matcha drinks. But coffee? Would you be surprised if I told you that coffee is popular in Japan too? I was surprised that the coffee-drinking community here is huge. In fact, it is the fourth largest in the world. 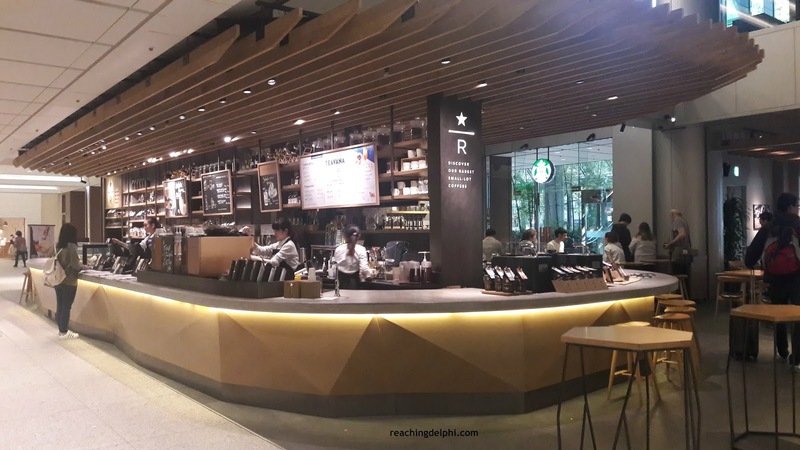 The large number of customer-packed cafes and shops selling coffee beans is a testimony to this. So, not to worry—your coffee needs will be taken care of. Starbucks is popular everywhere in Japan, and quite frankly, I must admit that liked the Japanese Starbucks. Perhaps it was the cup, or the water, or the milk, or the bean, or even the barista. I cannot explain why. If you are a coffee lover, remember to also check out a kissaten or a local coffee shop. Most of the coffee for Japan’s consumption is imported. A small amount of local coffee beans is grown in the Okinawa districts. Coffee was introduced to Japan in the 1800s by the Dutch Trading Company. 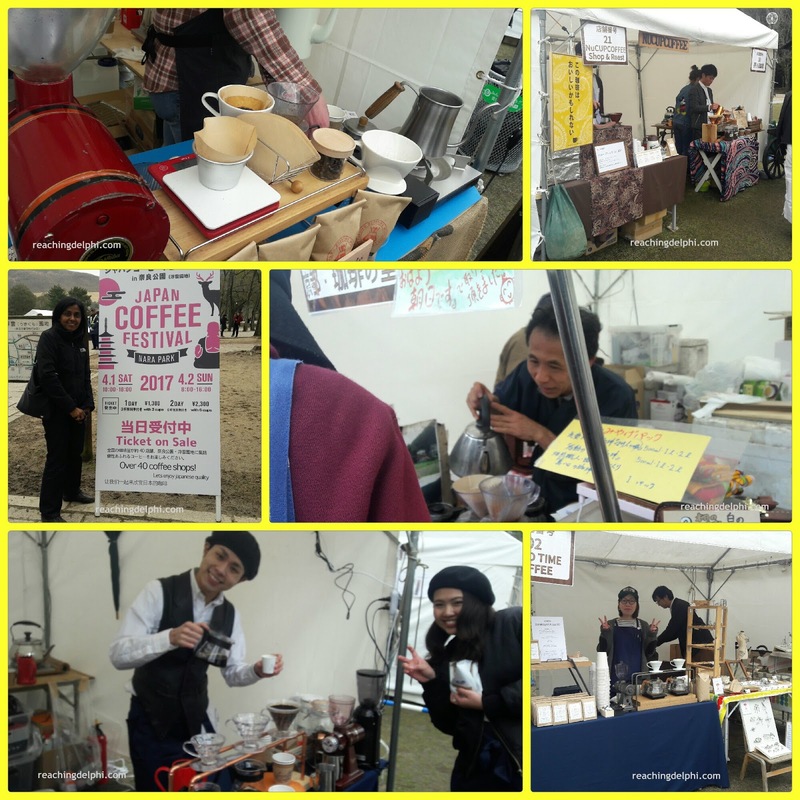 While in Nara, I also got a chance to visit the Japan Coffee Festival, where I sampled plenty of strong drip coffee that kept me awake all night. 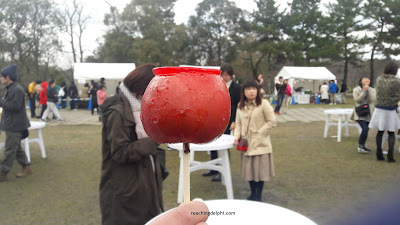 I want to sample local delicacies in Japan. What should I do? Sushi. Tempura. Udon. Soba. These are just a few. In Japan, visitors will get the opportunity to savour both regional and seasonal cuisines. My preferred choice is anything vegetarian. Usually it is not easy to get the vegetarian version of local dishes, but we managed to find a couple in Osaka. If you have a sweet tooth, do not leave without trying an Ichigo Daifuko. It is a soft, chewy mochi (glutinous rice cake) with sweet stuffing. Did you get a chance check out the Sakura Calendar I mentioned earlier? Can you still make it for this season? I am smitten by the buds of spring. I cannot wait for them to bloom more. I am counting the days! While I do that, here a few recent pictures of spring from our friends. Counting Stars, Reaching Delphi. See you again in part two.